Gloster GA.1 / GA.2 "Ace"
The design of the Gloster "Ace" dates back to 1942, when due to Rovers inability to deliver the W2 Whittle turbojet engine in any thing like the numbers needed, the British Ministry of Aircraft Production put out a tender for a single engined aircraft as specification E.5/42, the plan was abandoned when Rolls-Royce took over production of the jet engine from Rover in late 1942. Gloster however continued to work on the design (GA.1) intending to install the de Havilland H1"Goblin" engine, by November 1943 construction of the first two airframes was begun (SM801 and SM805). In 1944 a new specification was issued by the Ministry of Production E.1/44, calling for a single engined aircraft powered by the new Roll-Royce "Nean" engine. Gloster soon revised the GA.1 design to meet the new E.1/44 specification, and was issued a contract for three prototypes for the reworked GA.2. Stopping all work on the two airframes then under construction to build the first GA.2 airframe (SM809). With work starting in late 1944 and the prototype being completed in 1947, there was no great hurry as the Second World War had ended. 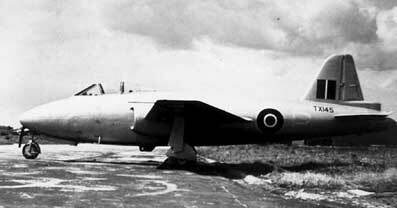 But in July 1947 as the first aircraft was being delivered to Boscombe Down for testing by road, the vehicle jackknifed and damaged SM809 beyond repair, work was speeded up on the second airframe TX 145, which took to the air on 9/3/48 flown by Bill Waterton, with the aircraft performing quite satisfactorily. 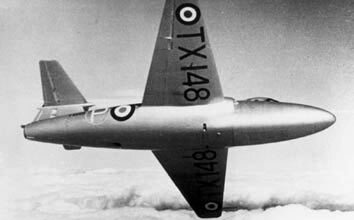 The third prototype TX148 took off in 1949, this had a new tail, which subsequently was fitted on to the "Meteor" F8, but in late 1949 the GA.2 program was abandoned with a fourth prototype TX150 still under construction, the reason given was the aircraft's"Limited development potential". The remaining two aircraft were to remain flying as testbeds at Farnborough for a year or so, being withdrawn for service and scrapped in 1951.